1. Block it Off. Erecting a pool-side fence will prevent young children from gaining access to pools without designated supervision present. 2. Sound the Alarm. A pool alarm sounds when it detects an object breaking the surface of the water. These should be used in combination with self-closing, self-latching gates for maximum safety. 3. Don’t Go Down the Drain. NEVER sit on a drain cover as powerful suction can lead to serious internal injury or entrapment! Fingers and toes are easily caught on drain covers, leaving the most competent swimmers helpless. Submersion in water for even a minute can cause serious harm to swimmers. To avoid accidents, replace poorly-made, non-functioning, defective or broken drain covers before they become a hazard. 4. Keep it Moving. The CSA Group Standard for Children’s Playspaces and Equipment outlines the need for equipment to drain effectively so that water is not trapped or collected. Standing water creates drowning hazards and can become a breeding ground for bacteria and mosquitoes. 5. Keep the Trap Shut. Make your pool safer by installing anti-entrapment drain covers and also in your hot tub and whirlpool. A safety vacuum release system for entrapment emergencies will automatically stop suction and shut down the pump. All covers and emergency releases should be certified by an accredited testing and certification organization. 6. Float Away. Not everyone can swim, so make sure you can provide appropriate floatation devices. 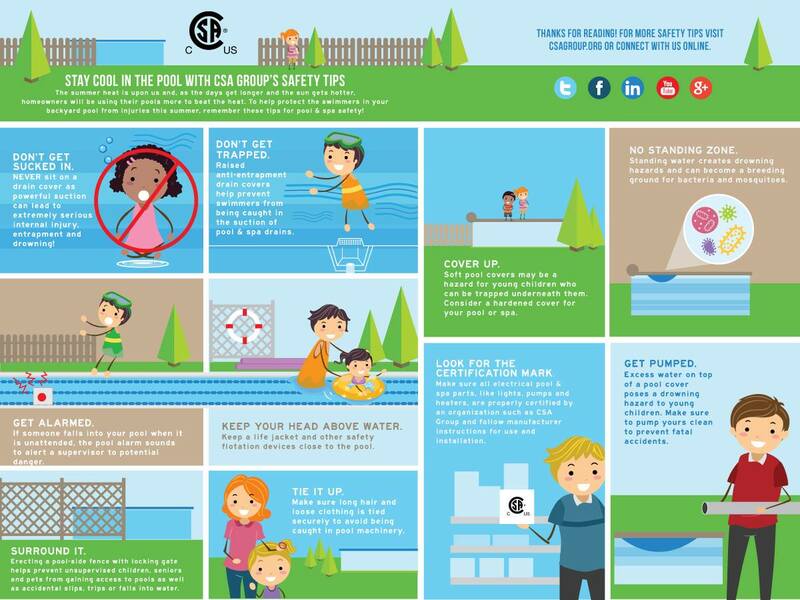 Keep a life jacket and other safety flotation devices close to the pool so that everyone can have fun and stay safe. 7. Clear the Cover. A soft pool cover can heighten the risk of drowning for young children, who can slip and become trapped underneath it. Children can also drown in water that has collected on top of pool covers. 8. Dry Up. If you use a pool or spa cover, follow all instructions for their safe installation, use and maintenance. Always remove a cover completely before using the pool, and do not let standing water remain on top; pump it off. 9. Tie it Back. Pool pumps and drains use suction to keep your water clean, but they can also be powerful enough to hold swimmers underwater. Make sure long hair and loose clothing is tied securely to avoid being caught in pool machinery. 10. Look for the certification mark. Ensure that all electrical pool parts (lights, pumps, heaters, etc.) are properly certified by an accredited organization such as CSA Group. Hot tubs and whirlpools should also be certified. CSA Group has a lot more safety tips. For more information about us, please visit www.csagroup.org.